A. Measure an amount to use. C. Start by adding 1 drip of water for every gram of dry powder. D. Pinch and mix until lump together. F. Form your piece, and allow to completely dry, ~usually 24 hours. G. Start your carving, engraving. H. Fire in the kiln at least 1250F for 30 minutes or not over 1680F for 20 minutes. I. Allow cool, now its done! Just burnish or polish and finish your creation. MIXING - The contents SILVER AND BINDER are combined together inside the one packet. The mixed powder should be placed in a non-porous container, i.e. glass, plastic, or glazed ceramic BUT NOT METALLIC. A way to remember how much water to add is simply start by adding ONE DRIP TO EVERY GRAM of dry powder (NOTE: drips from an eye dropper are a third to half the volume of a fat-drip from a faucet). Allow powder to soak up water then begin mixing around with finger or mini spatula. You can also hydrate the MCP on a piece of plastic cling film. Next pinch up the mix when it is quite dry but can lump all together, move to the palm of hand and lightly moisten when needed and continue kneading until it is clay-like. Afterwards the mixed clay should be allowed to MATURE before use by allowing it to set for at least 15 minutes wrapped in plastic cling film. After maturation, the clay should be rolled flat and kneaded a few times before working with. If the clay become very sticky when kneading in your hand, just continue to knead allowing the binder to soak up the moisture and it will become more and more less sticky to the hands. In this latest update, small dark colored gels can be visible when initially hydrating MCP. These gels indicate the clay needs more kneading if seen after maturation. We recommend that you do not use oils or glycerin when mixing the clay, as those will inhibit the properties of the binder (see A More Workable Clay? section below). The moisten silver clay never 'sets' like cement, therefore hardened work-in-progress can simply be wetted (albeit will take a longer from a fully dried clay), but it will dissolve in water. Unused moist clay may be stored if closed tightly in plastic cling wrap. Use only room temperature water, tap is ok, best if distilled water is used. SHAPING - Kneading is important but under some circumstance tiny air bubbles could become trapped in the folds, make sure kneading is done with lots of squeezing. Also it is better you flattened the clay down on a surface then cut out with a blade. While working the clay will dry out if the humidity in the work area is less then 100%, therefore keep a wet cotton tip swab handy for moisturizing. As SUGGESTION: You may want to add in a few drips ~1:5 liquid soap to water to the moistened MCP (see A More Workable Clay? section below), this can further increase drying while working the clay and allow for ease in carving afterward. If you're making an impression of another object onto the clay a release agent or thin coat of oil may be used on the surface of that object then the clay pressed onto that surface then released shortly thereafter. After a shape is made coat with a slip paste to smoothen its surface. This may be done by rubbing the surface with water on your finger to smoothen out finger print impressions and fill cracks made by folds in the clay. If you are using Burn Aways metal clay template mold, the clay will need be pressed on to with sufficient force to completely filling its voids. DRYING - Air drying the clay is best if rested on a brick or coated metal or nylon mesh surface and especially if it has a decent flat surface area. The clay objest should air dry for a period of 12-24 hours before firing. For MCP v3.5 clay warping on drying is much less of an issue since the clay generally have a degree of flex when air dried. Dry clay will have more bend warm versus that of lower temperature. When MCP is molded or pressure applied to make an impression of an object, you should remove from that surface before the clay dries. MCP dried out on a surface can be difficult to remove intact. Using a hair blow drier or mug warmer are methods of rapid dry but still be aware of the surface the clay is upon. Do not use a hot blow gun and never place moist or partially moist clay in kiln or use the torch. Once dried the clay's shape can be refined with the use of a cutting tool, knife, or rotary tool. Dried rolled flat clay can be cut with scissors and can be scribed with engraving/die-cutting machines like the Cricut� and Silhouette� Cameo as well as be punched thru with stampers and embossing/crimper pliers. FIRING - Your MCP can be fired atop a stove or flame torch, but a kiln is highly recommended. Your pre-fired clay or green-body must be completely dry of moisture before being fired or blistering and excessive warping can occur. We recommend a kiln or high temp furnace over a torch flame because there is better control of temperature versus the unevenness of an open flame. Range top or stove top (natural gas open air) firing will not attain temperature high enough to fuse the silver, it will only burn away the binder. Firing time varies with the thickness of the item and efficiency of the kiln or even-ness of the flame spread. Small rapid heat furnaces will generally require 50% more hold time. A higher firing temp will require only a slightly less firing time. Pre-fired items should be placed in the kiln held at 600F for up to10 minutes to burn away binder, then increase temperature to begin sintering. The minimum hold temp is 1250F, with a max fire temp of 1680F. For a hard fire (necessary for rings and most jewelry) hold at the upper temperature range for an excess of 20 minutes + 20 minutes for each millimeter of thickness. For maximum hardness and shrinkage you should hold at the max temp for 2 hours. Rapid heating will quickly vaporize the binder, and the clay may flake, blister, pop pieces off or crack. Small pieces of silver findings and wire as well as other silver clay objects can be fused together when kiln fired at max temp. Firing clay must be done in a ventilated area as the firing of metal clays produce smoke. Do not initially fire MCP in activated carbon. If a carbon fire is required, make sure you fire at 1250F for 20 minutes in open air before doing so. At 1250F the silver will shrink a minimum with binder burn off and allow for alteration before a finish firing. Imagine owning the philosophers stone? Rather yet a philosophers powder in which you add water then burn in fire, and finally emerge an object of solid silver. You now have the power to transform mud into an object of fine silver beauty. The main ingredient is pure silver metal, along with organic binder and water. When the product is fully air-dried, and fired at the appropriate temperature and time, the finished product will have great strength, and will take a polish just as any other silver metal object. The purpose of the MCP? MCP allows for artists to use silver clay in a variety of different ways. A versatile clay with almost indefinite shelf life, MCP is a value alternative enabling you to make limited production runs or create larger artistic sculpture while maximizing profit margin. The advantage of silver clay in powder form. MCP only needs water to bring it to life. Even hardened unused clay can be brought back to life with just a few drops of water. If you have made a mistake such as your work-in-progress got cracked or broke, you can make a thin clay paste, and actually cement-together the pieces. Say you destroyed your work-in-progress, simply dissolve it in a few drops of water then you have clay once again. MCP has almost unlimited shelf life. To prolong the effectiveness of the binder it should always be kept in its bag and away from dampness. 50 grams of MCP is equal to approximately 60 grams of a workable fine silver clay! Some other clays on the market may be selling you up to 20% water and binder in their package. Metal Clay Powder is non-poisonous, but then again a lot of silver powder in your system isn't good; not for anyone. The binder component is made of a mixture of long chain cellulose that are from plant derived fibers. Heating the clay will release volatile vapors that will sustain a flame in open air. Artisans should wear dusts mask and glasses if carving with a sharp object, high speed rotary tool or powered sander/grinder. Improperly fired clay can pop and send chips flying. MCP (moist) should not 'stay' in contact with other metal surfaces except silver or gold. The clay powder does not contain mercury, lead ...only metal is Silver. Price is $67.99 Free shipping within USA, select your quantity after you click 'Add to Cart' button below. International buyers Must Add $32 for world wide shipping no matter the quantity. If an economical shipping method is used you will be refunded. Silver powder: is the most valued ingredient, generally valued four times higher than market price for silver. We developed a method to make and dry the silver powders quickly and efficiently. The silver used in MCP is at least 99.9% fine silver. The binder is made of a cellulose fiber derivative and modified corn starch. MCP can be used in conjunction with or as a slip with other available silver clays. MCP will shrink during the drying phase as water can contribute up to ten percent of the clay mass. As it dries it will become smaller and can shrink up to 1%. Clay Fire Shrinkage: The minimum fire temp is 1250F; Pieces fired at this temp will experience about 10% linear shrinkage however the fired object will have less strength thus will be easily burnished but will much easily scratch and break when bended. Higher temperature firings i.e. 1680F and longer hold temps e.g. 60 minutes or longer will yield the densest end product with shrinkage ranging 11% to 13% linear. The higher firing temp objects will be harder (more malleable) than lower fire temp objects. Large items such as sculptures and pieced thicker than a small coin should be fired longer than the specified time. Generally add 15 to 20 minutes of fire time for every millimeter in thickness the item is. Patinas: If you want to add a patina either with sulfur or iodine, it is best if you hard fire your clay. Clay objects fired at low or mid range temperatures are more porous and will soak up external liquids. Liver of sulfur and iodine toned clays that were not hard fired will continue to coat over even long after it has been dried and finished. A hard fire is necessary to avoid the leaching of surface patina chemicals. Silver sulfide is the most water insoluble substance known that can dissolve in water! Hydrogen Peroxide is an excellent stop bath for patina chemicals. When you're ready to work with MCPSILVER999 use Distilled water: Not all bottled water is the same. Look for distilled water at your grocery store. Truly distilled or de-ionized water hydrates the binder best. Rain water actually beats most store bought distilled waters! Bottled drinking water for the most part is the same as tap water as it contain halides for preservation. Working in low humidity will reduce the drying time. Do not freeze the clay after it has been mixed. Glycerin: Can add about 50% more flex to the dried clay. It also reduces the likelihood that it may stick to a mold as it is pressed in. In this update additional cellulose, glue and soap are not necessary to improve workability. White School Glue: when added to moistened clay will stiffen clay. In some applications an artist may want a hard clay but not one that is on the brink of drying out. Note: clay additives may increase firing shrinkage from a green form. Refrigerate: thin pieces with large surfaces may warp or bend some upon drying; usually due to uneven drying. Placing in the refrigerator may reduce warping especially useful if you use molds. 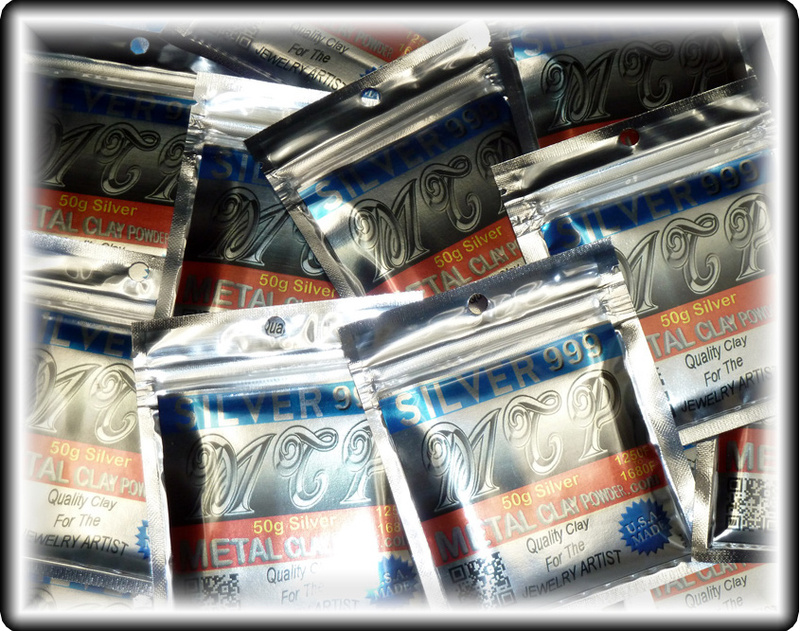 Roll it out: When removing MCPSILVER999 from its package it may feel solid and grainy. This is fine because when it is hydrated and properly kneaded it will turn out smooth and pliable. Small dark spots may be seen when you initially work your clay. It is necessary to let your clay mature for 15 minutes or 10 minutes of constant kneading between fingers. The dark spots are tiny gels that link together as the clay is worked, these gels will disappear. When it has been worked well in hand place it between two sheets of plastic cling film (adhesive backing paper works very well) and roll with a rolling pin making it flat. Pick the flattened clay up and knead further and roll it flat again. You may have to do this four or five times or more. Minimizing Porous Surface: porous surfaces on clay means air is becoming trapped when rolling. Using plain paper with a thin light layer of oil soaked in will allow the trapped air to escape. Normally the clay should sit at least one minute before removing from the paper. Syringe applicator: You can use a syringe as a clay/paste applicator. Use a syringe of 5cc or better without a needle. Pieces of left over clay are placed into the syringe and plunger re applied. Add in water to the level of clay, cap the syringe and set aside for a at least 2 days. This syringe applicator is useful for joining two or more pieces of clay before or after being fired. Filling a syringe for use as an applicator is best done with two syringes. First syringe is used to evenly hydrate the clay. With the nozzle removed (broken away), squeeze out the clay directly into the bottom of the next syringe, filling it slowly as to minimize trapping air. You then re-insert the plunger then push up slowly until the clay flows out the nozzle..
960 Alloy Clays. Starting about 2013, artisans discovered the benefits of sterling alloy clays' harder fire but with the ease of firing 999f.s. clay. As you may wondered clay artists have experimented with MCPSILVER999 mixing it with other silver clay and base metal clay products that are available. 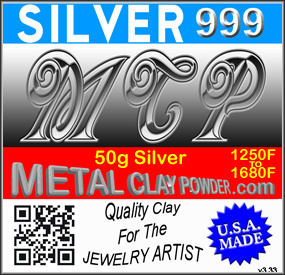 Although we do not encourage MCPSILVER999 to be mixed with other clay products, we however won't condone your own endeavors nor will we promote a specific brand over another. It should however be noted that base metal powered clays are a poor choice to make an alloy with MCPSILVER999. Better success although have been achieved with a 50/50 mixture of a ready-use sterling clay than a 96/4 mixture of a ready-use copper or base metal clay. A base mold is a form at which you will use as a basis to make your clay object on... similar to how a dressmaker use a form to measure patterns on. The lowest cost base mold is made from ordinary beach sand. First you should choose the sand, and sieve through a strainer to get the smallest possible grain size. Further grinding in a (non-purpose) coffee mill or with a mortar and pestle to make a finer sand. Wash this sand well in a pot, if possible boil the sand to wash and rinse away all salts, and debris. Now dry the sand by heating on stove or oven in a glass pot. Allow to cool then sieve this sand and place in a jar for storage. To make the base mold, obtain methyl cellulose, tapioca, or modified grain starch and one heaping tablespoon should be enough for a coffee cup of sand. Add in small amounts of water until you can shape the sand easily into the shape you desire. Allow this to dry then form your metal clay around or on this sand mold and allow to dry on the mold. If your metal clay object can easily be removed from the mold then take it off prior to placing in kiln; if not then place the clay object including base mold and fire at the required temperature for the metal clay. Once cooled, the sand mold will fall to free flowing sand again at which can be discarded. This is especially useful method when making hollow forms and larger 3D objects. There are fancy other products available including hollow glass spheres and carbon-based solids like wood dust which shrinks too, all work well, but nothing beats sand price-wise. Wood Workers and Carpenters: Imagine Metallic Silver Inlay! MCPSILVER999 can be used as inlay. Since the binders are made of plant based products, the clay will easily fuse hard to routed; either hand routed or laser routed wood. Sand it down once dried and buff the silver along with the wood surface then protect with linseed or a varnish. This of course requires no burning, kiln, or firing and shrinkage around 7% a reapplication may be necessary..
MCP can be fired along with some pottery works, or unfired as a coating for plaster. It may also work as an inlay for low temperature cured polymer clay art. Imagine the luster of silver to give a bas-relief a cameo appearance. Or s'grafitto with silver layers. ☛ ~Latest Update~ v3.6 or MCPflex. Product now exhibits 12% fire shrinkage (13% overall). Latest binder component allow for added flexibility, slow drying, less sticky and easier flow, ideal for syringe applications. 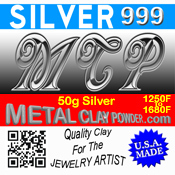 ☛ The New Metal Clay Powder! Now called MCP SILVER 999, version 3. These updates come with all new packaging that is lightweight and takes up less space. Now giving you the full 50 grams of silver powder. This version was replaced by the v3.5 in summer 2015. ☛ Introduced in 2006, Silver Smiths' Metal Clay Powder is the first silver clay to be sold in powder form and sold for only half the price other commercially available ready made silver clays. Versions 1 and 2 carried on until 2013.